As someone who’s lived outside of Ireland for almost eight years, there’s an element of risk involved in my asserting much about contemporary Irish life. Not only have I been gone for a significant amount of time, I’ve been absent during an era of rapid social change on many fronts, including attitudes towards sexual and gender identity. I cobble together an approximation of everyday Irish life through conversations with family, media sources, and what I can glean first-hand during the couple of weeks I get to spend at home each year. While I believe what I manage to manufacture is accurate, I don’t underestimate the significance of the lived experience. I lack the profound understanding of Irish life that must be acquired both directly and daily. I’m too far away for too long at a time to feel the creeping changes that occur as the nation shapes and reshapes itself everyday through the millions of interactions and conversations that take place in every corner of the county. I’ve watched the changes that have happened for us as an LGBTQI community, but without having lived them, there’s still something about these advances that seem sudden to me. Visiting home in 2014, I saw two men walking past the gates of Trinity College holding hands. For a moment my heart stopped. I was in disbelief. I felt joy, then jealousy, then pride, and then they were gone. I wondered if it had actually happened, and then chastised myself for staring if indeed it had. 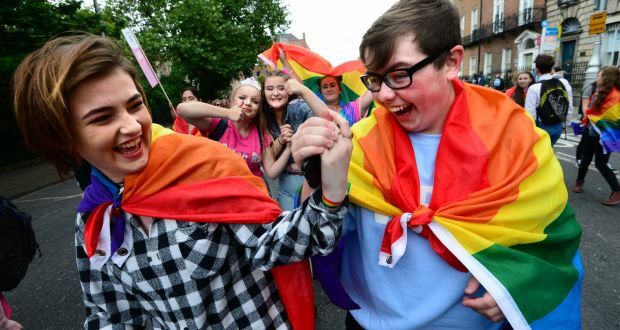 I watched with hope and horror as Ireland prepared for the Marriage Equality referendum. I came close to tears as I played and replayed clips of strangers taking boats and planes home to vote yes for me. When I left Ireland eight years and one lifetime ago boys didn’t hold hands in the street. Panti Bliss hadn’t addressed the nation in their own living rooms on Christmas day, and the elected officials of Ireland hadn’t all but unanimously supported a referendum granting access to one of Ireland’s most traditionally cherished institutions for one of Ireland’s most traditionally excluded groups. Then along came Leo, and again, I found myself wondering how – as a long term emigrant – my feelings about this latest advancement might stack up against those of people living in Ireland. Of course, I welcomed the news of a gay taoiseach. I was elated; initially at least. Something of real significance had happened in a place I still call home and had left because of difficulties with my own sexuality. The election of a gay Taoiseach was more powerful evidence of acceptance, and after all, isn’t acceptance what those of us who grew up out-of-bounds crave the most? My experience of this latest social milestone began to shift from the visceral to the intellectual. I understood the significance of our new Taoiseach being – among many other things – gay, but I no longer gushed in the way the recently empowered are wont to do. I wondered what might be wrong. After the Marriage Equality Referendum there had also been an anticlimax for me, but that was because I was so far removed from where I wanted to be to celebrate – home. I truly felt as though I could burst with relief and joy. The people of Ireland were sound, and it looked like they thought I might be sound too. The anticlimax I felt on that occasion was because I couldn’t find a gratifying way to express my joy, not because I didn’t feel joy. I turned to the internet to help me sort out my feelings. I wanted my deflated spirits to be roused by smiling faces, rainbow flags, and jubilant signage. While the international media was abuzz with headlines about Leo Varadkar’s sexuality, and what it said about the modern Emerald Isle, Ireland itself seemed to share my stunted sensibilities. Prominent news sources scratched their heads and pondered whether it’s actually that big a deal that Ireland has a gay Taoiseach. Several other articles acknowledged the significance of a gay Taoiseach, but stood only briefly on this point before getting down to the business of the composition of the Varadkar cabinet, and what his conservative philosophy might mean for social programmes. Another article pointed out that in many ways Varadkar could be categorised accurately as more-of-the-same; he’s a man; he’s the privately-educated son of a doctor. Ireland appeared to be more concerned with Varadkar’s political leanings rather than his sexual ones. There really was a sense of so what? It turned out, in this instance, I did have my finger on the unruffled pulse of the nation. As I thought more about it, I grew to love the lack of reaction to our Taoiseach – Ireland’s and my own. True inclusion isn’t about marriage or Taoisigh, it’s about being allowed to be completely ordinary, and for our differences to be seen but not to matter that much at all.